The impressed mark I DALE BURSLEM is found on the rear of the figure. The letter "I" is used for"J". Three distinctive sprig forms occur on marked Dale figures and are potential identifiers of Dale's work. Typically this measures 30-32mm. Here it is seen on Aesculapius, impressed with the Dale mark. We have only seen this on two figures that we cannot confidently attribute to Dale. 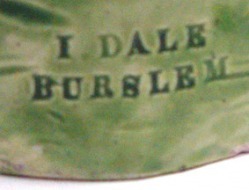 Seen here on the base of a marked Dale figure symbolizing Earth. Hitherto, we have seen this sprig repeatedly on figures marked or attributable to Dale. Seen here on the base of a marked Dale figure symbolizing Fire. Hitherto, we have seen this sprig repeatedly on figures marked or attributable to Dale. 1. Five-fingered bocage leaf. Dale, like many other potters, used this leaf. It is the only bocage leaf form recorded on marked figures. 2. Blunt ended fern leaves, each leaf having seven serrations on its margin. This leaf form is found on figures attributable to Dale because of features shared with marked figures. 3. Three-fingered bocage leaf. 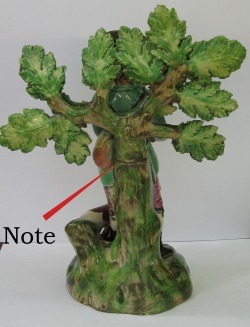 This leaf form is found on figures we attribute to Dale because of features they share with marked figures. These flower types are associated with Dale figures. The flowers are sometimes strewn on the base. 1.An eight-petalled flower. This flower is confined to marked Dale figures and to figures we can reasonably attribute to Dale. 2. A twelve-petaled flower, with alternating long and short petals. 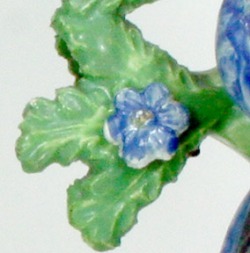 This flower occurs almost exclusively on figures displaying attributes of marked Dale figures. Its presence strengthens, but does not necessarily confirm, the argument for Dale attribution. 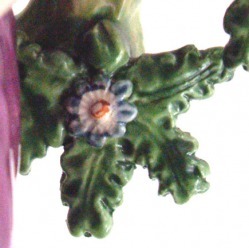 We have recorded one example of this flower on a figure with no Dale linkage. That figure is marked "Tittensor". 3. A six-petalled flower with splayed, gently rounded petals. 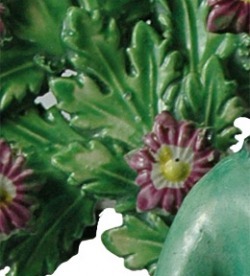 This flower is found on figures that display attributes found on marked Dale figures. Its presence strengthens, but does not necessarily confirm, the argument for Dale attribution. Most marked Dale figures have distinctive faces that are pleasingly plump. In conjunction with other features, they can strengthen the case for a possible Dale attribution. These two faces are from marked Dale figures. Tooled depressed lines, rather like the teeth marks that would result from pressing a comb into clay, are distinctive, but not unique, Dale features. They occur on the bases of figures. These examples are both from marked Dale figures. Bocages made to insert into a socket--rather like a candle into a candlestick--are rare. 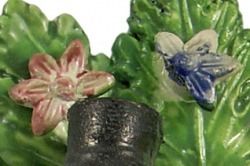 This clever technique enabled the vulnerable bocage to be made independently of the rest of the figure and secured in the socket for the final enamel firing. If the bocage was damaged, all was not lost: only the damaged bocage had to be remade. Sometimes the heat of the last firing melded the enamels in the socket, securing the bocage in place. We have seen only one bocage socket figure that we are unable to attribute to Dale. The figure on the left has a bocage inserted into a socket. The same figure form on the right has lost its bocage and the empty socket is visible from the rear. Spill vases on figures linked to Dale have zig-zag edges, but other potters occasionally used this structure too. Yellow-green enameling. Bases are often painted in a bright yellow-green, as can be seen on the marked figures and on many of the figures linked to Dale because they share multiple features with marked figures. Large, bright flowers of varying form adorn some bases.